*Note that this isn't a detail, but a maintenance wash. Washing your car like this twice a month helps everything stay pretty. The more you let the car go, the more grime builds up, the more time this will take. This is a fifteen minute, two dollar wash, for those enthusiasts driving their car on a regular basis. The idea is to keep things looking good in between details. Time and money depend on the size of the vehicle and how often the car receives a wash.
For some people, the idea of washing the car takes too much time. But, you can speed up this process the more you practice. That seems obvious. But what really speeds things up is having a system. Here's the one we use for a quick wash.
A mitt. Some like sheepskin. Some like microfiber. Your call. Soap and All Purpose Cleaner. Brand? We've used all types. Any name brand, though avoid anything with too much acid, especially on your wheels and tires. Acid has the potential to stain. We also avoid anything with too much coloring pigment. A car wash with a power washer helps speed things up, but your garden hose works just as well. A few quarters less, a few minutes more; easy exchange. 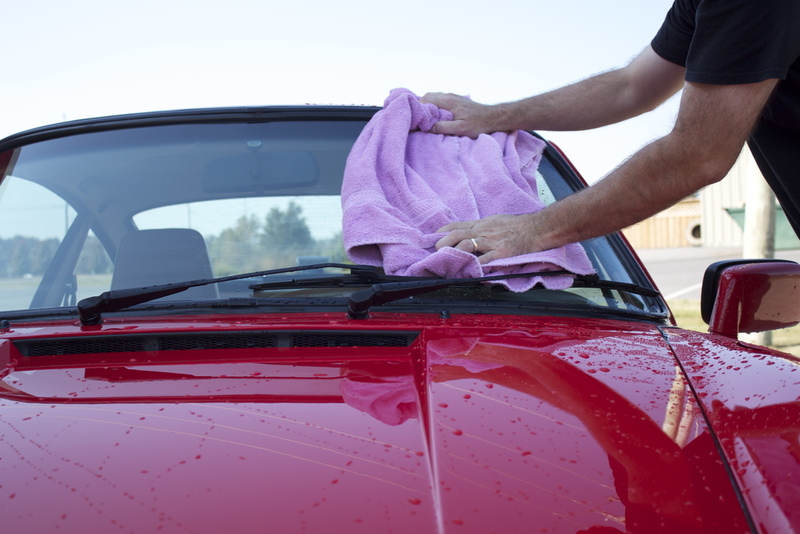 The morning or late evening is the best time to wash as the car hasn't been sitting in the sun all day. Hot paint leads to all sorts of problems. So, find some shade, let the car cool down. Once the paint is cool to the touch, you can start the washing car. 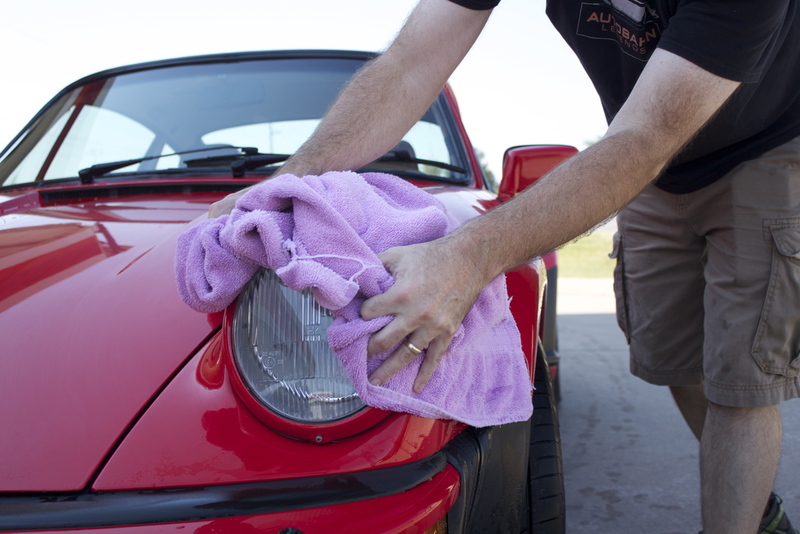 Spray the fender wells with an all-purpose cleaner to loosen up grime and dirt. Be careful about getting any of this on your exterior paint or wheels. We're not going to address the wheels for a basic wash.
2. Soak the car - move quickly. If you're at the car wash, plug in your dollar and move fast because you're on the clock (even if you're at home, you want to move fast before anything evaporates). Start at one point and rinse all the way around the car, moving from top to bottom, focusing on the areas where there is loose or heavy grime on the paint. Once you come back to your starting point, hit the wheels. The purpose is to get rid of any exterior grime that may be stuck to the pain. Soak everything, get the car very wet. In your last twenty seconds of the first dollar, prep the mitt and bucket with your favorite soap. Soap goes on the mitt and in the bucket. Agitate the soap with your power washer or hose to get a good froth going. 4. Take it from the top - ready to mitt. With your mitt, soap the vehicle from the top down using very light, consistent. Always moving quickly, making sure you've covered the entire area. On these cleaner areas, you can move faster. Starting at one point on the roof, go around the vehicle. Key point: move quickly. Then do the same to the windows, hood, and trunk. Move to the upper side of your vehicle, go around again, then do the lowest part of the car last. 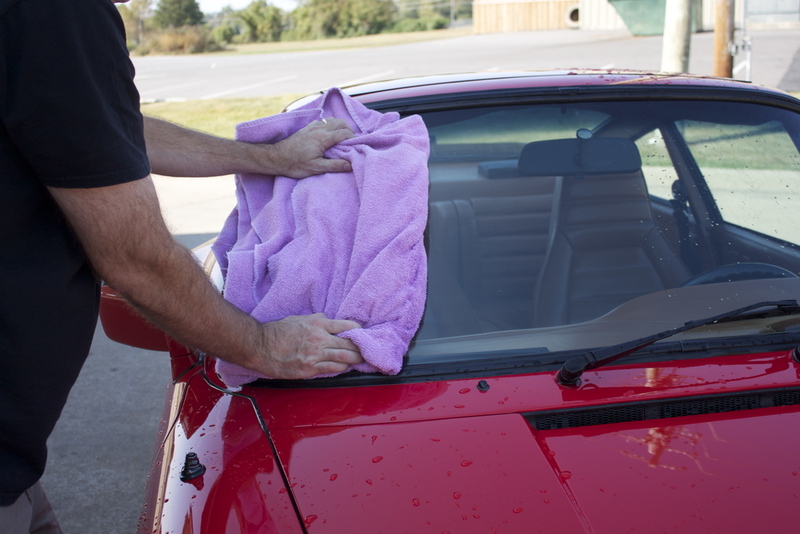 Moving from the top down keeps you from spreading grime over where you've already cleaned. Mitt any small cracks and spaces between panels. Bug spots may need extra mitting. Focus on corners and spaces in between the hood, bumper, and lens corners. Give some extra care to spaces around headlamps. These small openings hoard dust. This is why you're moving quickly before, because now you are forced to take your time on the more stubborn areas. Start from the top down, again. Move from the top down, and from the middle of the car to the outside. Rinsing is very important to remove debris and soap spots. Again, move quickly. Rinse out rain gutters and body gaps if your car has them. This is as close as you want to get. Soap tends to get caught where trim meets body panels and seams, and sometimes this requires a little extra pressure. A large, soft cotton towel works well. Fold it in half once, and then again. Dry with one side until that side is soaked, then flip the towel over. Start with the top and work your way down again. Use little to no pressure. This keeps what you've already dried dry.